Hang On! This Llama’s Resisting! 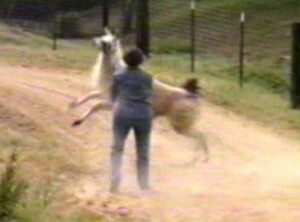 These photos from our DVD Llama Training with Bobra Goldsmith show that llamas can at times resist what you want them to do. Bobra is just giving the llama enough space, and she is hanging on. This was an untrained adult; click on the DVD title to find out more about the program. As you might guess from these images, the legaliities of this DVD are that you use what you learn at your own risk! You can avoid getting in this situation if it is more than you want to tackle, by training llamas when they are young — around 6 months is a great age — or by only acquiring trained adult llamas. We did that; I never found myself in this position! 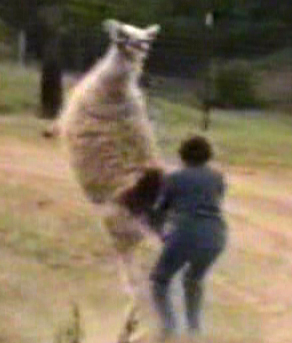 I’m sorry the photo is rather fuzzy — it’s just a snap taken from the DVD and the llama was moving pretty fast! There is a lead rope going up to the halter of the llama. No longer airborne, the llama is coming back to a more normal position. After just a little more prancing around, the llama was quite willing to work with Bobra. It certainly could be a handraised llama but it also could have had bad training experiences that led it to decide people were not good news. We once had a llama who disliked men with beards. You can imagine what I guessed, what she had encountered before we got her! 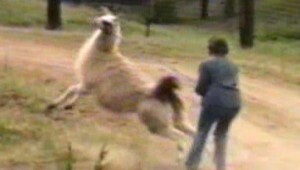 Sheila, the llama that is spitting on you was probably hand raised and that can be dangerous, the llama might kick or neck wrestle you. There is a way to train it out of it but it is intensive training and it take a little while. Sheila, just click on the book cover of the ebook from any page of the site and that takes you to the download page. Where it says to right click, do that. 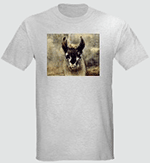 Hi — I am the webmaster and owned llamas but it is our friend Bobra Goldsmith who does the training in the videos we produced… you can search google for how to contact her at Rocky Mountain Llamas in Longmont, CO. I don’t know if she travels or not. I don’t think driving llamas would be appropriate with kids, but hiking with them is much easier. There are quite a few llama owners in Canada…. 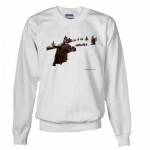 find them with google by searching something like Alberta llamas, and see what you can find! 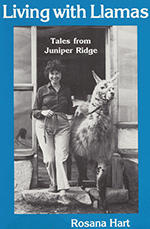 You might like to download my free ebook about our experiences with llamas, which includes a lot of practical info. I just came across your info as I was surfing the net tonight. Several Llamas are being “given away to good homes as people have too many, are moving or whatever reason they have in the Edmonton Alberta Canada are…Where are you? I’d like to say your Llama affection Picture was wonderful to see..It is obvious that you love these beautiful animals and thanks for setting alot of myths to rest…they spit at one another…communication…not at humans..I am interested in your driving expertise and wondered if you know anyone here in Alberta who “trains driving Llamas’ I am setting up a Pastoral Retreat and underpriveleged children’s center…Hope Healing Center on a farm (80 acre’s) and was thinking this would be a novel animal/event to have on the ranch; unfortunately I myself know very little to nothing and hence the research (Other than seeing the odd documentary where the Peruvians I believe were using them for packing, riding, guarding herds)… Our neighbours did have one named Buddy who could clear a 4 foot fence from a complete standstill to go visit the neighbours herd as well…. :) Not sure I am ready for the rodeo it appeared you were enjoying while intraining? Are they a stubborn animal like donkeys, moody, kick like horses?, bite like colts? Then there’s shearing, wool marketing>???Feeding??? WOW.. Thanks…Do you travel or give presentations on the animals?